The New York Foundation for the Arts (NYFA) offers resources for the arts to people with and without disabilities. NYFA Source, NYFA’s online searchable database, provides listings of sponsors, art grants, and fellowship programs for the disability community. 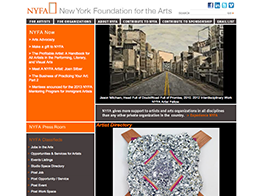 NYFA also provides a hotline to help artists navigate NYFA’s programs and database (1.800.232.2789).